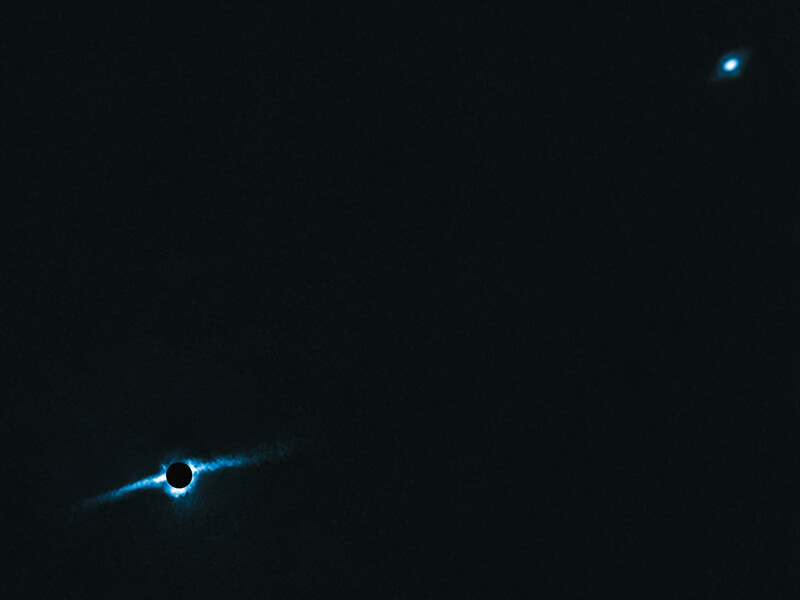 Observations by ESO’s planet-finding instrument, SPHERE, a high-contrast adaptive optics system installed on the third Unit Telescope of ESO’s Very Large Telescope, have revealed the edge-on disc of gas and dust present around the binary star system HD 106906AB. 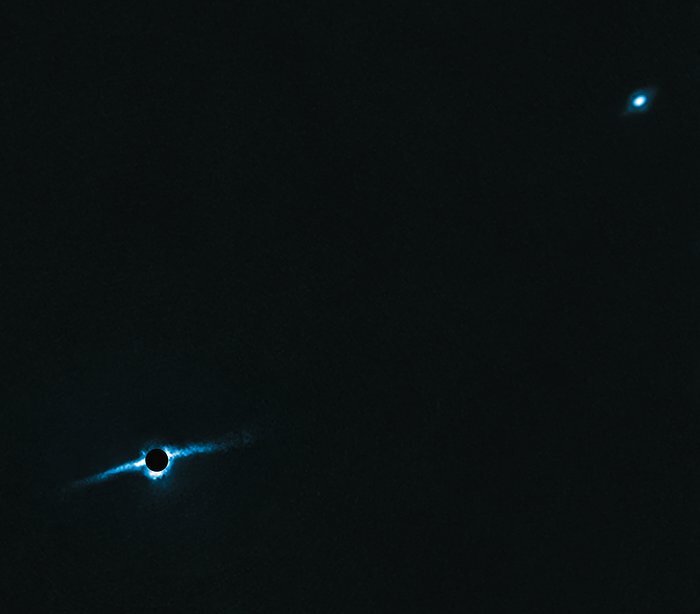 HD 106906AB is a double star located in the constellation of Crux (The Southern Cross). Astronomers had long suspected that this 13 million-year-old stellar duo was encircled by a debris disc, due to the system’s youth and characteristic radiation. However, this disc had remained unseen — until now! 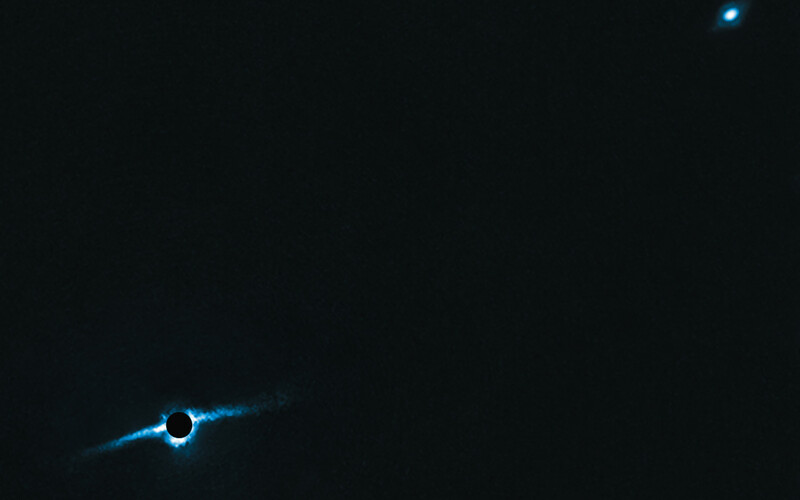 The system’s spectacular debris disc can be seen towards the lower left area of this image. It is surrounding both stars, hence its name of circumbinary disc. The stars themselves are hidden behind a mask which prevent their glare from blinding the instrument. These stars and the disc are also accompanied by an exoplanet, visible in the upper right, named HD 106906 b, which orbits around the binary star and its disc at a distance greater than any other exoplanet discovered to date — 650 times the average Earth–Sun distance, or nearly 97 billion kilometres. HD 106906 b has a mammoth mass of up to 11 times that of Jupiter, and a scorching surface temperature of 1500 degrees Celsius. Thanks to SPHERE, HD 106906AB has become the first binary star system to have both an exoplanet and a debris disc successfully imaged, providing astronomers with a unique opportunity to study the complex process of circumbinary planet formation. Position (Dec): -55° 58' 23.54"